We’ve teamed up with Ursula Brewery and Bully Stole My Lunch to kick off Corn Hole season with a bang! There will be a live DJ and Ursula Brewery will be on hand pouring Bully Stole My Lunch (formerly Crustless) all day and pairing with the Texas Toast Take-Over (a full menu featuring Texas Toast specials). 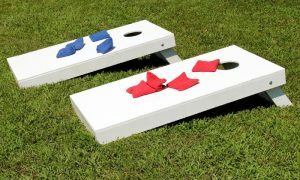 $10 entry fee into the Bags Tournament. (2 man teams, Tournament rules to follow) Ursula Brewery is sponsoring the 1st place prize which is a choice of a trip for two to Las Vegas Nevada or Lake Tahoe. Second and Third prize announcements still to come. Register in person at GVR Beer Garden or here.